What can philosophy really offer to the practice of architecture? What can it help architecture to think and do? 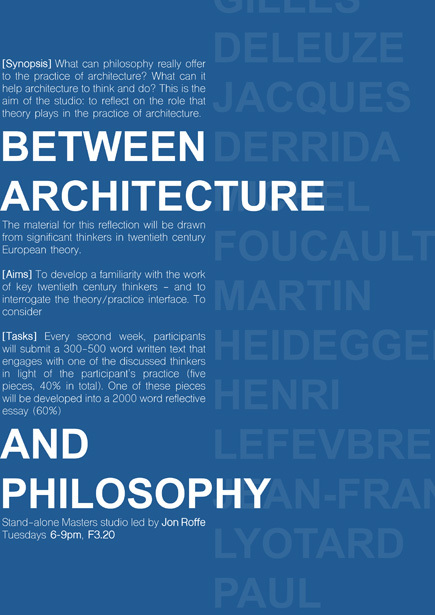 This is the aim of the studio: to reflect on the role that theory plays in the practice of architecture. The material for this reflection will be drawn from significant thinkers in twentieth century European theory. Working in collaboration with Austral Bricks, students will design, fabricate and explore the design potential of a new brick. 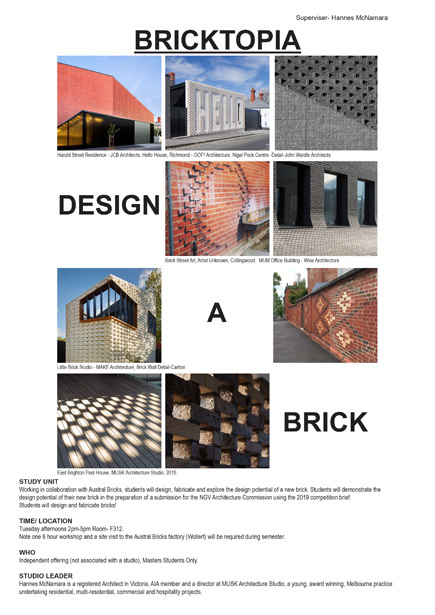 Students will demonstrate the design potential of their new brick in the preparation of a submission for the NGV Architecture Commission using the 2019 competition brief. Students will design and fabricate bricks! Tuesday afternoons 2pm-5pm Room- F312. Note one 6 hour workshop and a site visit to the Austral Bricks factory (Wollert) will be required during semester. Independent offering (not associated with a studio), Masters Students Only. Hannes McNamara is a registered Architect in Victoria, AIA member and a director at MUSK Architecture Studio, a young, award winning, Melbourne practice undertaking residential, multi-residential, commercial and hospitality projects. 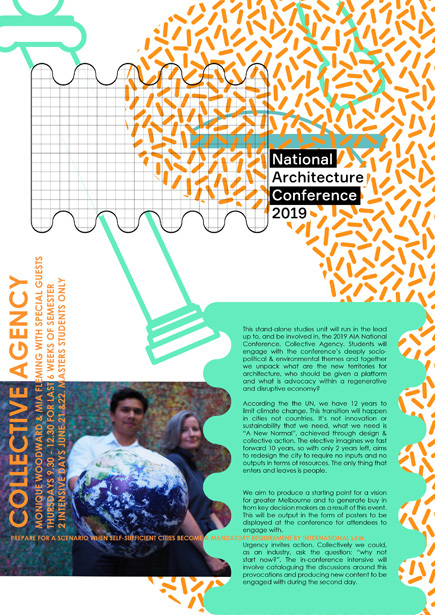 This stand-alone studies unit will run in the lead up to, and be involved in, the 2019 AIA National Conference, Collective Agency. Students will engage with the conference’s deeply socio- political & environmental themes and together we unpack what are the new territories for architecture, who should be given a platform and what is advocacy within a regenerative and disruptive economy? According the the UN, we have 12 years to limit climate change. This transition will happen in cities not countries. It’s not innovation or sustainability that we need, what we need is “A New Normal”, achieved through design & collective action. The elective imagines we fast forward 10 years, so with only 2 years left, aims to redesign the city to require no inputs and no outputs in terms of resources. The only thing that enters and leaves is people. We aim to produce a starting point for a vision for greater Melbourne and to generate buy in from key decision makers as a result of this event. This will be output in the form of posters to be displayed at the conference for attendees to engage with. Urgency invites action. Collectively we could, as an industry, ask the question: “why not start now?”. The in-conference intensive will involve cataloguing the discussions around this provocations and producing new content to be engaged with during the second day. In 1963 Peter Eisenman submitted his PhD thesis consisting of 600 analytical drawings primarily focusing on studies of GiuseppeTerragni’s 1932 Casa del Fascio in Como, Italy. The thesis has generated various responses over time, but significant criticism from Diane Ghirardo, a renowned scholar in Fascist Architecture, suggesting that Eisenman analyses the form of the building unrealistically detached from its political context of Fascism. 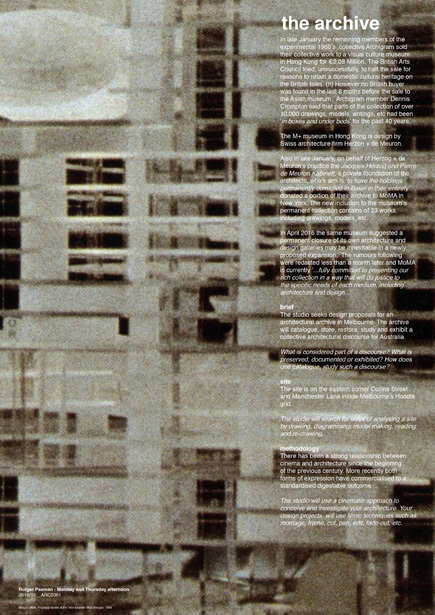 In 1994 and 1995 in Progressive Architecture magazine, a discourse unfolded regarding this issue involving the opinions of around 20 prominent architects and scholars including Elizabeth Diller, Rem Koolhaas and Bernard Tschumi in defence of the validity and inclusiveness inherent in the analysis of form. Exploring and exhibiting the legacy of the Small Homes Service. 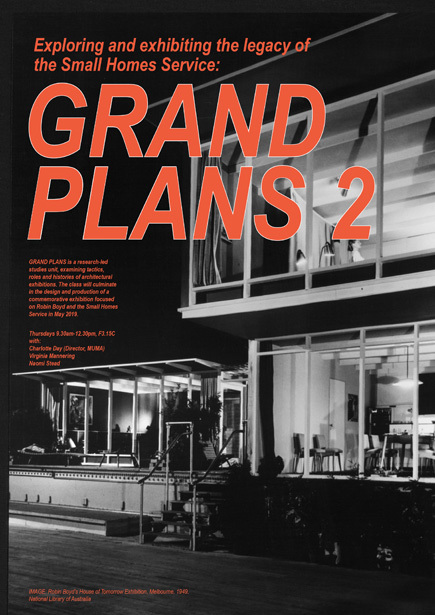 GRAND PLANS is a research-led studies unit, examining tactics, roles and histories of architectural exhibitions. The class will culminate in the design and production of a commemorative exhibition focused on Robin Boyd and the Small Homes Service in May 2019. 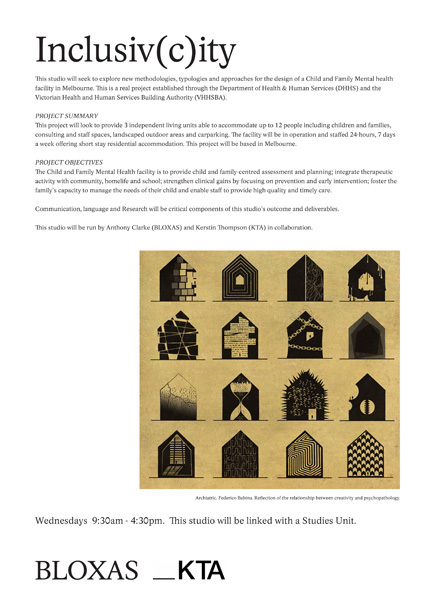 This Studies Unit (also linked with a Design Studio) will seek to explore new methodologies, typologies and approaches for the design of a Child and Family Mental health facility in Melbourne. This is a real project established through the Department of Health & Human Services (DHHS) and the Victorian Health and Human Services Building Authority (VHHSBA). The main aim of the studies unit is to explore communication techniques be it verbally, through 2D graphics, 3D techniques or film for example. These communication techniques will be tested, and discussed throughout the semester not only by those in the architecture faculty but other professions, and those linked to the design brief. 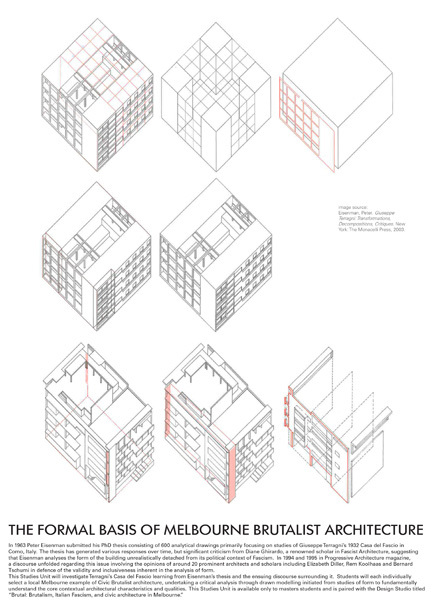 Research into the existing and current typologies for relevant projects. this will include selective readings and discussions/ contributions in class on a regular basis. An ability to utilize different types of communication techniques to explain conceptual thinking. Communication, language and Research will be critical components of this Studies Unit outcome and deliverables. Monday 10:00am - 1:00pm. This Studies Unit will be linked with a Design Studio. 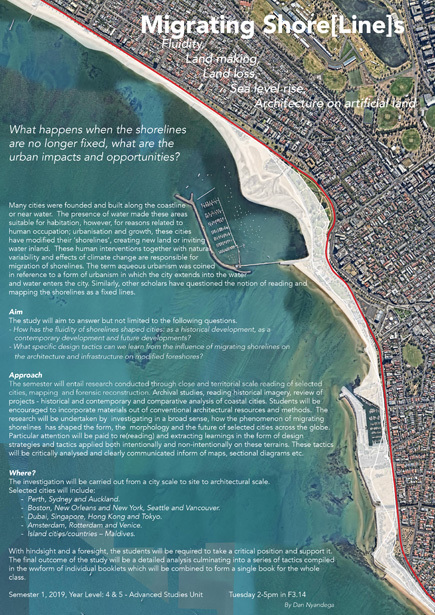 What happens when the shorelines are no longer fixed, what are the urban impacts and opportunities? Many cities were founded and built along the coastline or near water. The presence of water made these areas suitable for habitation, however, for reasons related to human occupation; urbanisation and growth, these cities have modified their ‘shorelines’, creating new land or inviting water inland. These human interventions together with natural variability and effects of climate change are responsible for migration of shorelines. The term aqueous urbanism was coined in reference to a form of urbanism in which the city extends into the water and water enters the city. Similarly, other scholars have questioned the notion of reading and mapping the shorelines as a fixed lines. The study will aim to answer but not limited to the following questions. How has the fluidity of shorelines shaped cities: as a historical development, as a contemporary development and future developments? What specific design tactics can we learn from the influence of migrating shorelines on the architecture and infrastructure on modified foreshores? 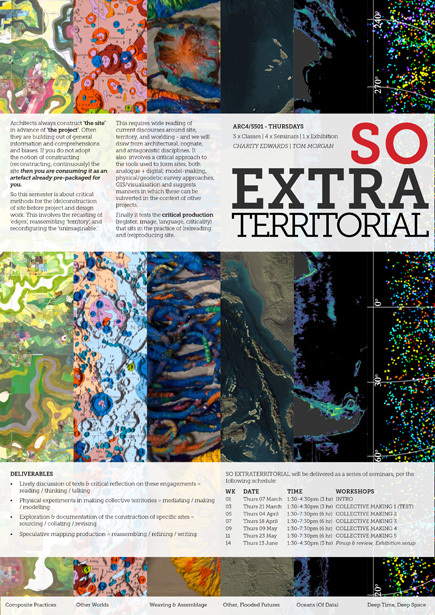 The semester will entail research conducted through close and territorial scale reading of selected cities, mapping and forensic reconstruction. Archival studies, reading historical imagery, review of projects - historical and contemporary and comparative analysis of coastal cities. Students will be encouraged to incorporate materials out of conventional architectural resources and methods. The research will be undertaken by investigating in a broad sense, how the phenomenon of migrating shorelines has shaped the form, the morphology and the future of selected cities across the globe. Particular attention will be paid to re(reading) and extracting learnings in the form of design strategies and tactics applied both intentionally and non-intentionally on these terrains. These tactics will be critically analysed and clearly communicated inform of maps, sectional diagrams etc. Boston, New Orleans and New York, Seattle and Vancouver. Dubai, Singapore, Hong Kong and Tokyo. With hindsight and a foresight, the students will be required to take a critical position and support it. The final outcome of the study will be a detailed analysis culminating into a series of tactics compiled in the wwform of individual booklets which will be combined to form a single book for the whole class. 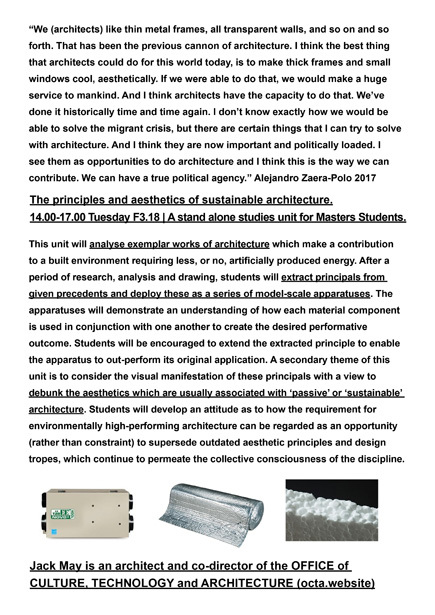 This unit will analyse exemplar works of architecture which make a contribution to a built environment requiring less, or no, artificially produced energy. After a period of research, analysis and drawing, students will extract principals from given precedents and deploy these as a series of model-scale apparatuses. The apparatuses will demonstrate an understanding of how each material component is used in conjunction with one another to create the desired performative outcome. Students will be encouraged to extend the extracted principle to enable the apparatus to out-perform its original application. A secondary theme of this unit is to consider the visual manifestation of these principals with a view to debunk the aesthetics which are usually associated with ‘passive’ or ‘sustainable’ architecture. Students will develop an attitude as to how the requirement for environmentally high-performing architecture can be regarded as an opportunity (rather than constraint) to supersede outdated aesthetic principles and design tropes, which continue to permeate the collective consciousness of the discipline. 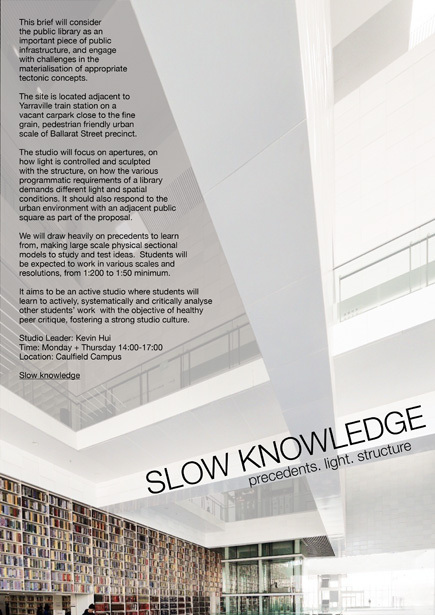 14.00-17.00 Tuesday F3.18 | A stand alone studies unit for Masters Students. Rear Window advance architecture studies unit runs in parallel with Rear Window design studio to explore design research approaches and reinforce the intellectual and design contexts for the studio explorations. The unit will also focus on visual methods that critically examine, document and expose the project and projection of architecture as a tool of thinking. The word “manifesto” comes from the Latin manifestus which means: ‘detected in the act’, ‘evident’, make visible’. 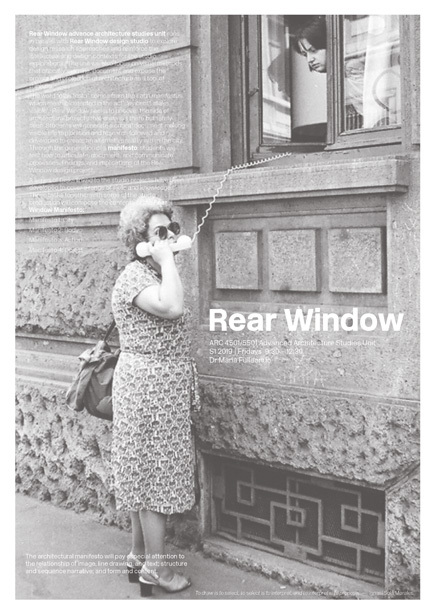 Rear Window seeks to uncover the side of architectural projects that is always there but rarely seen. 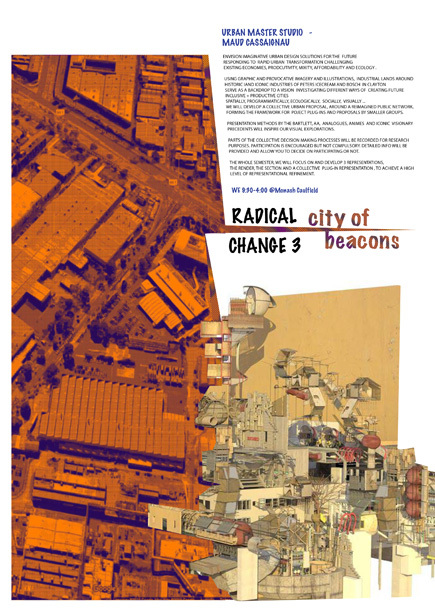 Students will generate a critical document making visible the exploration and research followed and developed to create an alternative reality within the city. Through the generation of a manifesto, students will test how to articulate, document, and communicate processes, findings, and implications of the Rear Window design project. The architectural manifesto will pay especial attention to the relationship of image, line drawing, and text; structure and sequence narrative; and form and content. 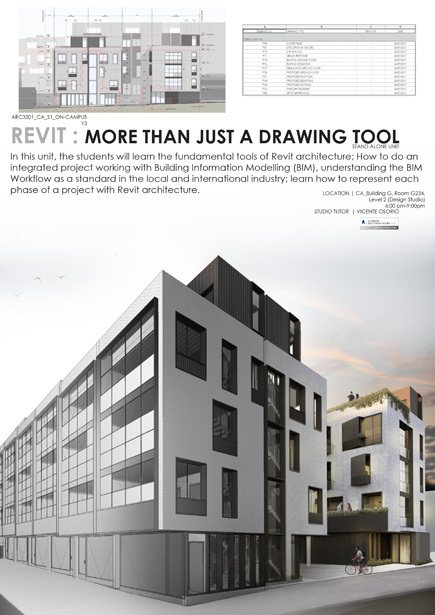 In this unit, the students will learn the fundamental tools of Revit architecture; How to do an integrated project working with Building Information Modelling (BIM), understanding the BIM Workflow as a standard in the local and international industry; learn how to represent each phase of a project with Revit architecture. Architects always construct ‘the site’ in advance of ‘the project’. Often they are building out of general information and comprehensions and biases. If you do not adopt the notion of constructing (reconstructing, continuously) the site then you are consuming it as an artefact already pre-packaged for you. This requires wide reading of current discourses around site, territory, and worlding - and we will draw from architectural, cognate, and antagonistic disciplines. It also involves a critical approach to the tools used to form sites, both analogue + digital; model-making, physical/geodetic survey approaches, GIS/visualisation and suggests manners in which these can be subverted in the context of other projects. Finally it tests the critical production (register, image, language, criticality) that sits in the practice of (re)reading and (re)producing site. Brutalism, Italian Fascism, and civic architecture in Melbourne. 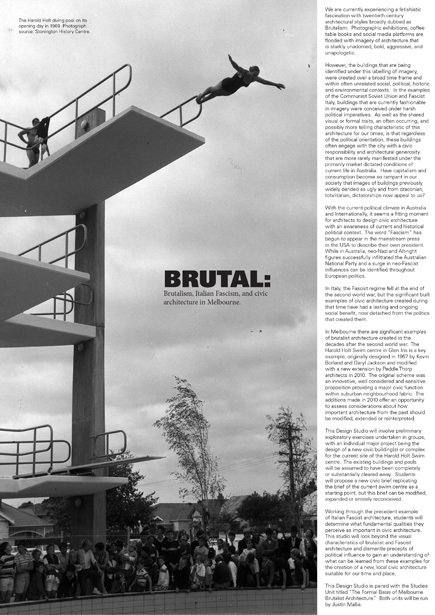 We are currently experiencing a fetishistic fascination with twentieth century architectural styles broadly dubbed as Brutalism. Photographic exhibitions, coffee table books and social media platforms are flooded with imagery of architecture that is starkly unadorned, bold, aggressive, and unapologetic. However, the buildings that are being identified under this labelling of imagery, were created over a broad time frame and within often unrelated social, political, historic and environmental contexts. In the examples of the Communist Soviet Union and Fascist Italy, buildings that are currently fashionable in imagery were conceived under harsh political imperatives. As well as the shared visual or formal traits, an often occurring, and possibly more telling characteristic of this architecture for our times, is that regardless of the political orientation, these buildings often engage with the city with a civic responsibility and architectural generosity that are more rarely manifested under the primarily market dictated conditions of current life in Australia. Have capitalism and consumption become so rampant in our society that images of buildings previously widely derided as ugly and from draconian, totalitarian, dictatorships now appeal to us? With the current political climate in Australia and Internationally, it seems a fitting moment for architects to design civic architecture with an awareness of current and historical political context. The word “Fascism” has begun to appear in the mainstream press in the USA to describe their own president. While in Australia, neo-Nazi and Alt-right figures successfully infiltrated the Australian National Party and a surge in neo-Fascist influences can be identified throughout European politics. In Italy, the Fascist regime fell at the end of the second world war, but the significant built examples of civic architecture created during that time have had a lasting and ongoing social benefit, now detached from the politics that created them. In Melbourne there are significant examples of brutalist architecture created in the decades after the second world war. The Harold Holt Swim centre in Glen Iris is a key example, originally designed in 1967 by Kevin Borland and Daryl Jackson and modified with a new extension by Peddle Thorp architects in 2010. The original scheme was an innovative, well considered and sensitive proposition providing a major civic function within suburban neighbourhood fabric. The additions made in 2010 offer an opportunity to assess considerations about how important architecture from the past should be modified, extended or reinterpreted. This Design Studio will involve preliminary exploratory exercises undertaken in groups, with an individual major project being the design of a new civic building(s) or complex for the current site of the Harold Holt Swim centre. The existing buildings and pools will be assumed to have been completely or substantially cleared away. Students will propose a new civic brief replicating the brief of the current swim centre as a starting point, but this brief can be modified, expanded or entirely reconceived. Working through the precedent example of Italian Fascist architecture, students will determine what fundamental qualities they perceive as important in civic architecture. This studio will look beyond the visual characteristics of brutalist and Fascist architecture and dismantle precepts of political influence to gain an understanding of what can be learned from these examples for the creation of a new, local civic architecture suitable for our time and place. This Design Studio is paired with the Studies Unit titled “The Formal Basis of Melbourne Brutalist Architecture.” Both units will be run by Justin Mallia. Envision imaginative urban design solutions for the future responding to rapid urban transformation challenging existing economies, prodcutivity, mixity, affordability and ecology. We will develop a collective urban proposal, around a reimagined public network, forming the framework for poject plug-ins and proposals by smaller groups. Presentation methods by the Bartlett, AA, Analogues, Animes and iconic visionary precedents will inspire our visual explorations. Parts of the collective decision making processes will be recorded for research purposes. Participation is encouraged but not compulsory. Detailed info will be provided and allow you to decide on participating or not. The whole semester, we will focus on and develop 3 representations, the render, the section and a collective plug-in representation , to achieve a high level of representational refinement. This studio will seek to explore new methodologies, typologies and approaches for the design of a Child and Family Mental health facility in Melbourne. 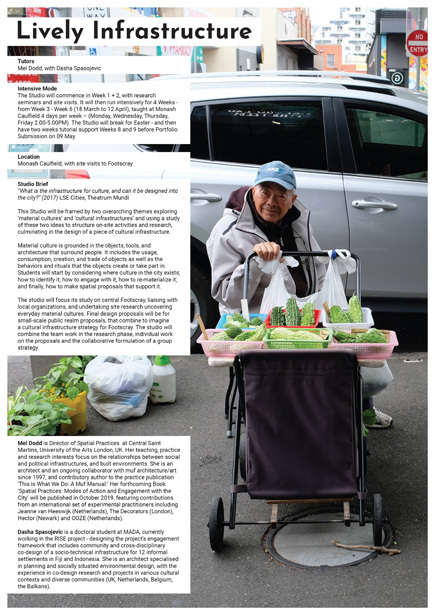 This is a real project established through the Department of Health & Human Services (DHHS) and the Victorian Health and Human Services Building Authority (VHHSBA). This project will look to provide 3 independent living units able to accommodate up to 12 people including children and families, consulting and staff spaces, landscaped outdoor areas and carparking. The facility will be in operation and staffed 24-hours, 7 days a week offering short stay residential accommodation. This project will be based in Melbourne. The Child and Family Mental Health facility is to provide child and family-centred assessment and planning; integrate therapeutic activity with community, homelife and school; strengthen clinical gains by focusing on prevention and early intervention; foster the family’s capacity to manage the needs of their child and enable staff to provide high quality and timely care. Communication, language and Research will be critical components of this studio’s outcome and deliverables. This studio will be run by Anthony Clarke (BLOXAS) and Kerstin Thompson (KTA) in collaboration. Wednesdays 9:30am - 4:30pm. This studio will be linked with a Studies Unit. This studio continues our collaboration with the Centre for Appropriate Technology and the Olkola Aboriginal Corporation. 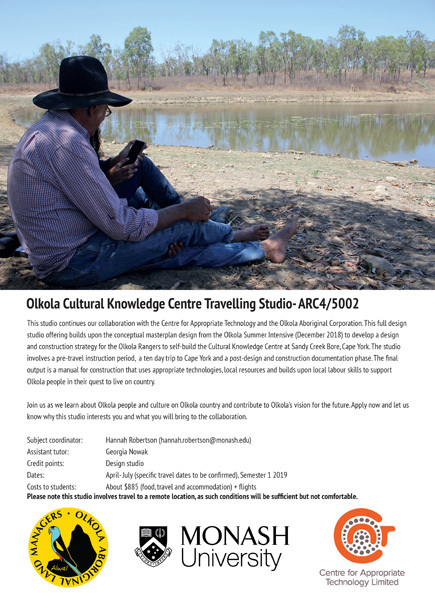 This full design studio offering builds upon the conceptual masterplan design from the Olkola Summer Intensive (December 2018) to develop a design and construction strategy for the Olkola Rangers to self-build the Cultural Knowledge Centre at Sandy Creek Bore, Cape York. The studio involves a pre-travel instruction period, a ten day trip to Cape York and a post-design and construction documentation phase. The final output is a manual for construction that uses appropriate technologies, local resources and builds upon local labour skills to support Olkola people in their quest to live on country. Join us as we learn about Olkola people and culture on Olkola country and contribute to Olkola’s vision for the future. Apply now and let us know why this studio interests you and what you will bring to the collaboration. Please note this studio involves travel to a remote location, as such conditions will be sufficient but not comfortable. Rear Window Studio operates in the urban centres where contemporary global phenomena such as globalisation or touristification are challenging and transforming the image, life, and interaction with our cities. The word “manifesto” comes from the Latin manifestus which means: ‘detected in the act’, ‘evident’, make visible’. Just as an architectural manifesto the studio will question the conventions of urban space found in contemporary ‘everyday’ life. Students will generate and imagine a miniature city that makes visible an alternative reality within the city by experimenting, inventing, questioning, and establishing new urban conditions. The studio recovers Koolhaas’s concept of ‘culture of congestion’ aiming to break the homogenous pattern of the current urban fabric, interrogating and challenging some of the existing social and cultural habits and proposing new ones. Project A | Proverb Transcripts: the invention and transcription of a collection of contemporary urban situations and conditions (social events) which generate city and construct society expressed as visual proverbs. Project B | City- Rooms (City- Bangs): three social interactive machines or micro theatres infiltrated in the existing fabric of the city. Project C | Urban Choreography: a street scene orchestrating the situation(s), conditions, rooms, etc. and its layers not simply as an architectural design but mostly as an architectural score. There are several main conceptual/theoretical references that students have to engage with to complete this studio. A number of readings and other resources such as films, videos and artwork will be provided during the semester. The studio will encourage the exploration of an expanded conceptual, programmatic and visual approach to architecture not necessarily aligned with disciplinary definitions, standard roles and ordinary outputs bringing together different disciplines such as art, theatre, cinemas, music and dance. 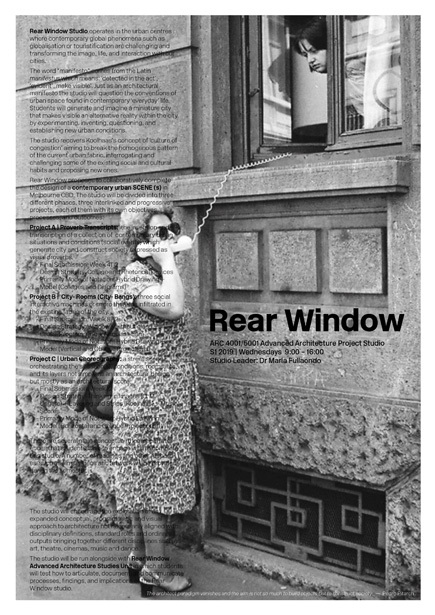 The studio will be run alongside with Rear Window Advanced Architecture Studies Unit in which students will test how to articulate, document, and communicate processes, findings, and implications of the Rear Window studio. The sharing economy represents a paradigm shift in the way we live, how we spend our time, what we want or need to own, where we work, what we do, and how much space we require. These are fundamental questions for design and the organisation of the urban realm. What are the opportunities and challenges that the sharing economy presents for architecture and the city, and how can we design for, around and against it? Home-sharing platform airbnb has developed a framework which enables a global pool of applicants to rent rooms on- demand, in shorter increments of time, and at a premium. As a result, the house and its contents are increasingly publicized, monetized and globalised. Beyond housing, the ‘sharing’ of resources and services via digital platforms has implications for labour markets, with the rise of the “gig economy” worker – and consequently, leisure time. In this context, StudioShared speculates on the future of living, labour and leisure – the fundamental acts which take place within the spaces and places we design. If the modern era produced the house as a machine for living, what is the architecture of the digital era? Building, neighbourhood and city. Through data activism, speculation, design-fiction, typological studies and image making, we will test new architectural models to support, critique or defend against the sharing economy. 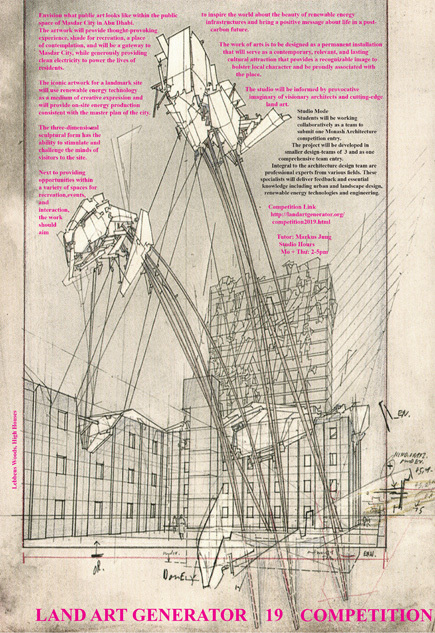 The studio will introduce a series of key texts and films, architectural projects and techniques that engage with the studio themes. Propositional projects by SuperStudio, Archizoom, MAIO, OMA, Nishizawa, Pezo von Elrichhausen, Dogma, Bureau Spectacular, Andres Jaques, DOMA and Jack Self embody some of the experimental, imaginative and critical approaches that this studio will encourage and foster. There is an emphasis on high quality, creative modes of representation - traditional model making and drawing will be engaged, but students will be encouraged to mine digital and physical techniques and methods from within the allied disciplines of art and design. 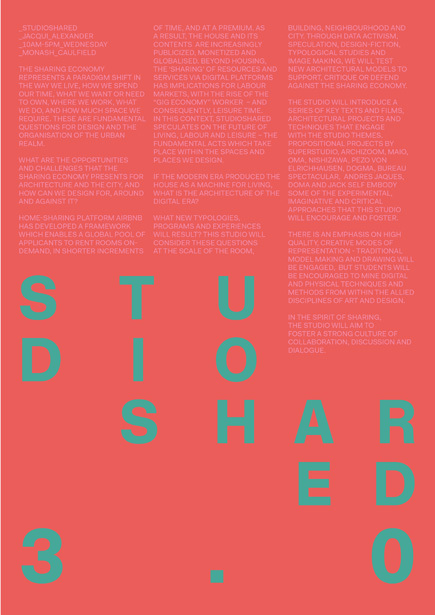 In the spirit of sharing, the studio will aim to foster a strong culture of collaboration, discussion and dialogue. As Melbourne grows, so too does the need to maintain and celebrate the integrity and memory of what makes Melbourne, Melbourne (Birrarung Ga). One-hundred thousand people have moved to Melbourne every year over the last four years. This has put pressure on issues of public space, housing, affordability, climate and civic participation at the centre, and at the edge, of Melbourne, where most of the new population resides. This studio zooms into Birrarung (Yarra River) and the changing relationship of the city to the river, which has been radically altered through occupation, agriculture, construction, industry, urban expansion and pollution. Birrarung, is one of many urban rivers under pressure across the world, despite the vital ecological, cultural and recreational value they offer. In the context of Melbourne’s recent and rapid growth, the aim of this studio is to focus on celebrating our identities and cultures. Students will undertake a masterplan to reconsider and reconnect with the river and identify sites for a cultural building, which they will then design. A cultural building is to be considered in its broadest sense: a gathering place to consume and create culture, a platform where people meet and exchange ideas, or a place to come together to share beliefs. Students will create their own brief and design protocols for the building in response to design research through mapping and class exercises as well as independent study. This studio investigates alternative design models for the suburban business_park – mono-functional, car-based employment centres typically lacking in vitality or design imagination. Students will examine historical modes of working, commercial building typologies, along with the industrial environments that have housed those activities, to understand the impact of industrialisation on suburban built fabric. Contemporary design case-studies will expose how the nature and location of ‘work’ have changed in response to technological advancements, societal shifts, evolving notions of ‘resources’ and ‘productivity’, and the environmental effects of what we produce. Individual projects will focus on the use, configuration and qualities of future work places at an architectural scale. Your final project briefs will emerge from the multi-scalar tests and development of team-based proposals for a future xxx_park. 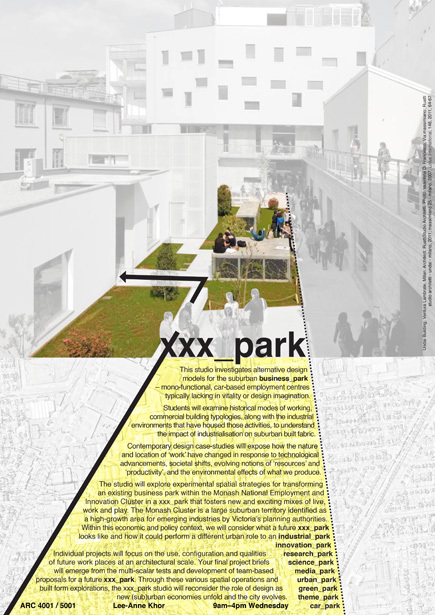 Through these various spatial operations and built form explorations, the xxx_park studio will reconsider the role of design as new (sub)urban economies unfold and the city evolves. A civic building for displaying video art with an outdoor cinema plaza. The building will include gallery spaces, education rooms, a cafe, bars and outdoor cinema and optionsl swimming pool. The centre of Image Sound and Installation aims at investigating an architectural prpoposition where architecture may explore the affect of the art, media and recent technologies in the proposal of a public centre for St Kilda. St Kilda is the birthplace for the first feature film world wide (The Story of the Kelly Gang 1906) so it seems appropriate to add this to the program and use some theoretical concerns from film theory in our research. 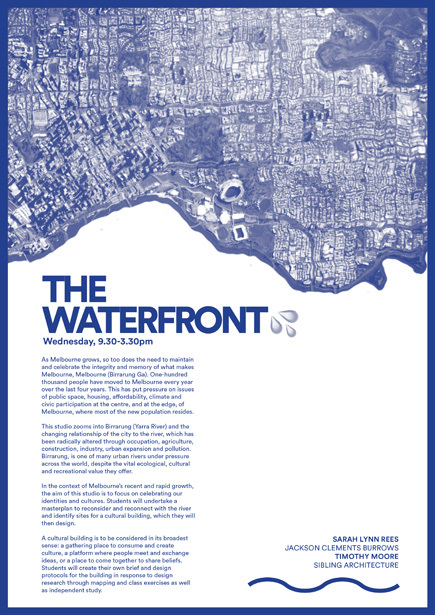 Students may also select to undetake some possible associated foreshore proposals for the St Kilda Pier / pool redevelopment currently being undertaken by the City of Port Phillip. 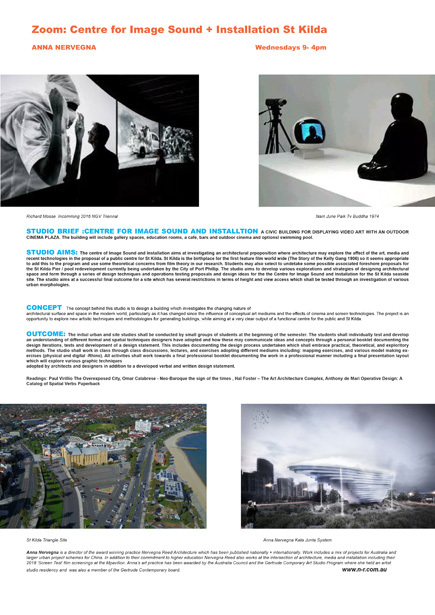 The studio aims to develop various explorations and strategies of designing architectural space and form through a series of design techniques and operations testing proposals and design ideas for the the Centre for Image Sound and Installation for the St Kilda seaside site. The studio aims at a successful final outcome for a site which has several restrictions in terms of height and view access which shall be tested through an investigation of various urban morphologies. The concept behind this studio is to design a building which investigates the changing nature of architectural surface and space in the modern world, particularly as it has changed since the influence of conceptual art mediums and the effects of cinema and screen technologies. The project is an opportunity to explore new artistic techniques and methodologies for generating buildings, while aiming at a very clear output of a functional centre for the public and St Kilda. The initial urban and site studies shall be conducted by small groups of students at the beginning of the semester. The students shall individually test and develop an understanding of different formal and spatial techniques designers have adopted and how these may communicate ideas and concepts through a personal booklet documenting the design iterations, tests and development of a design statement. This includes documenting the design process undertaken which shall embrace practical, theoretical, and exploritory methods. The studio shall work in class through class discussions, lectures, and exercises adopting different mediums including: mapping exercises, and various model making exercises (physical and digital -Rhino). All activities shall work towards a final professional booklet documenting the work in a professional manner including a final presentation layout which will explore various graphic techniques adopted by architects and designers in addition to a developed verbal and written design statement. In the era of privatization, investment in art production and the management of its consumption depends increasingly on the private sector. The aim of this architectural project and studio is to explore how public space can present an alternative to support cultural activity. Students are expected to generate an innovative programmatic response within a feasible context. The design process will be directed towards the architectural definition of the program and the tectonic development of the architectural project synthesising the original concept. 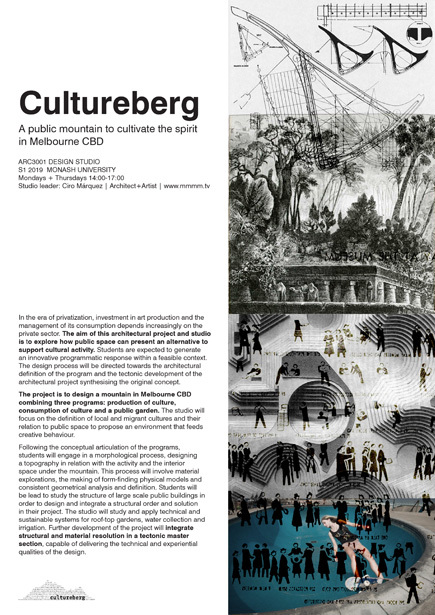 The project is to design a mountain in Melbourne CBD combining three programs: production of culture, consumption of culture and a public garden. The studio will focus on the definition of local and migrant cultures and their relation to public space to propose an environment that feeds creative behaviour. Following the conceptual articulation of the programs, students will engage in a morphological process, designing a topography in relation with the activity and the interior space under the mountain. This process will involve material explorations, the making of form-finding physical models and consistent geometrical analysis and definition. Students will be lead to study the structure of large scale public buildings in order to design and integrate a structural order and solution in their project. The studio will study and apply technical and sustainable systems for roof-top gardens, water collection and irrigation. Further development of the project will integrate structural and material resolution in a tectonic master section, capable of delivering the technical and experiential qualities of the design. Envision what public art looks like within the public space of Masdar City in Abu Dhabi. The artwork will provide thought-provoking experience, shade for recreation, a place of contemplation, and will be a gateway to Masdar City, while generously providing clean electricity to power the lives of residents. The iconic artwork for a landmark site will use renewable energy technology as a medium of creative expression and will provide on-site energy production consistent with the master plan of the city. The three-dimensional sculptural form has the ability to stimulate and challenge the minds of visitors to the site. Next to providing opportunities within a variety of spaces for recreation, events, and interaction, the work should aim to inspire the world about the beauty of renewable energy infrastructures and bring a positive message about life in a post-carbon future. The work of arts is to be designed as a permanent installation that will serve as a contemporary, relevant, and lasting cultural attraction that provides a recognizable image to bolster local character and be proudly associated with the place. The studio will be informed by provocative imaginary of visionary architects and cutting-edge land art. Students will be working collaboratively as a team to submit one Monash Architecture competition entry. The project will be developed in smaller design-teams of 3 and as one comprehensive team entry. Integral to the architecture design team are professional experts from various elds. These specialists will deliver feedback and essential knowledge including urban and landscape design, renewable energy technologies and engineering. This Studio will be framed by two overarching themes exploring ‘material cultures’ and ‘cultural infrastructures’ and using a study of these two ideas to structure on-site activities and research, culminating in the design of a piece of cultural infrastructure. Material culture is grounded in the objects, tools, and architecture that surround people. It includes the usage, consumption, creation, and trade of objects as well as the behaviors and rituals that the objects create or take part in. Students will start by considering where culture in the city exists; how to identify it; how to engage with it; how to re-materialize it; and finally, how to make spatial proposals that support it. a cultural infrastructure strategy for Footscray. The studio will combine the team work in the research phase, individual work on the proposals and the collaborative formulation of a group strategy. Mel Dodd is Director of Spatial Practices at Central Saint Martins, University of the Arts London, UK. Her teaching, practice and research interests focus on the relationships between social and political infrastructures, and built environments. She is an architect and an ongoing collaborator with muf architecture/art since 1997, and contributory author to the practice publication ‘This is What We Do: A Muf Manual:’ Her forthcoming Book ‘Spatial Practices: Modes of Action and Engagement with the City’ will be published in October 2019, featuring contributions from an international set of experimental practitioners including Jeanne van Heeswijk (Netherlands), The Decorators (London), Hector (Newark) and OOZE (Netherlands). Dasha Spasojevic is a doctoral student at MADA, currently working in the RISE project - designing the project’s engagement framework that includes community and cross-disciplinary co-design of a socio-technical infrastructure for 12 informal settlements in Fiji and Indonesia. She is an architect specialised in planning and socially situated environmental design, with the experience in co-design research and projects in various cultural contexts and diverse communities (UK, Netherlands, Belgium, the Balkans). The Studio will commence in Week 1 + 2, with research seminars and site visits. It will then run intensively for 4 Weeks - from Week 3 - Week 6 (18 March to 12 April), taught at Monash Caulfield 4 days per week – (Monday, Wednesday, Thursday, Friday 2.00-5.00PM). The Studio will break for Easter - and then have two weeks tutorial support Weeks 8 and 9 before Portfolio Submission on 09 May. The design studio will broadly investigate the potential for architecture to elevate the accessibility and value of regional areas and places. The studio, sponsored by the Break O Day Council in Tasmania will consider the potential to seed the economic growth of the East Coast region of Tasmania through careful and strategic tourism–focused development at locations along the ‘Great Eastern Drive’ touring route. The studio will specifically investigate, and design projects at a number of locations along the touring route. These sites will be chosen for the potential as traveller pull over spots (due to the surrounding spectacular landscape or significant historical setting) but are currently problematic in terms accessibility, safety and available amenity. Ideas generated in the studio will contribute towards a body of design research to be delivered to the council for purposes of pursuing funding to develop and implement actual projects in these locations. The focus for the semester will be on the material resolution of design ideas. Students will be designing programmatically simple buildings and structures, freeing them up to explore design projects in greater material, structural and tectonic depth. How contemporary architecture can embody and reinterpret the built vernacular of a place. Students will be challenged to understand and incorporate relevant building codes and standards into their designs to start to understand the process of ensuring projects are accessible, safe and comfortable, whilst being conceptually and experientially rich. The studio will run on Monday and Thursday afternoons_ 2 to 5pm . 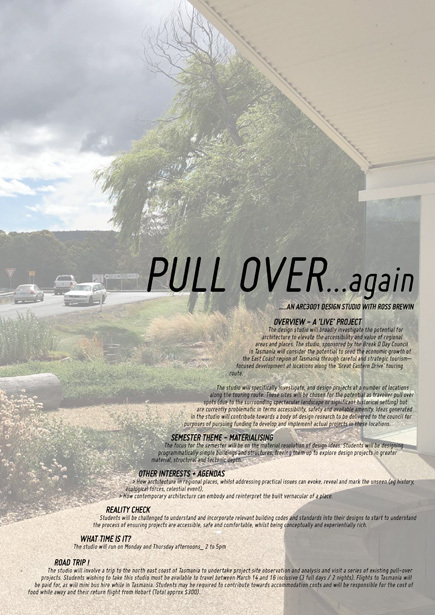 The studio will involve a trip to the north east coast of Tasmania to undertake project site observation and analysis and visit a series of existing pull-over projects. Students wishing to take this studio must be available to travel between March 14 and 16 inclusive (3 full days / 2 nights). Flights to Tasmania will be paid for, as will mini bus hire while in Tasmania. Students may be required to contribute towards accommodation costs and will be responsible for the cost of food while away and their return flight from Hobart (Total approx $300). Our site of investigation for the studio is a 86,000sqm disused arkose sandstone quarry. The site is located approximately 200km from Melbourne, just outside the township of Beech Forest, along a ridge-line within the Otway Ranges. 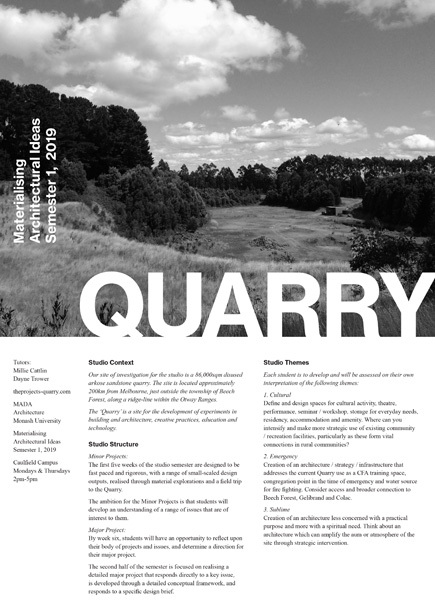 The ‘Quarry’ is a site for the development of experiments in building and architecture, creative practices, education and technology. The first five weeks of the studio semester are designed to be fast paced and rigorous, with a range of small-scaled design outputs, realised through material explorations and a field trip to the Quarry. The ambition for the Minor Projects is that students will develop an understanding of a range of issues that are of interest to them. By week six, students will have an opportunity to reflect upon their body of projects and issues, and determine a direction for their major project. 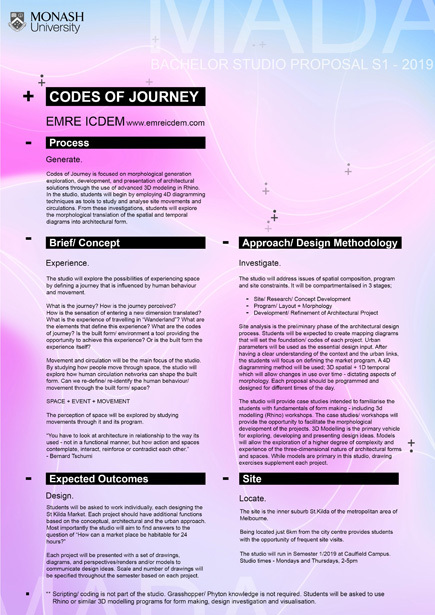 The second half of the semester is focused on realising a detailed major project that responds directly to a key issue, is developed through a detailed conceptual framework, and responds to a specific design brief. Define and design spaces for cultural activity, theatre, performance, seminar / workshop, storage for everyday needs, residency, accommodation and amenity. Where can you intensify and make more strategic use of existing community / recreation facilities, particularly as these form vital connections in rural communities? Creation of an architecture / strategy / infrastructure that addresses the current Quarry use as a CFA training space, congregation point in the time of emergency and water source for fire fighting. Consider access and broader connection to Beech Forest, Gelibrand and Colac. Creation of an architecture less concerned with a practical purpose and more with a spiritual need. Think about an architecture which can amplify the aura or atmosphere of the site through strategic intervention. This brief will consider the public library as an important piece of public infrastructure, and engage with challenges in the materialisation of appropriate tectonic concepts. The site is located adjacent to Yarraville train station on a vacant carpark close to the fine grain, pedestrian friendly urban scale of Ballarat Street precinct. The studio will focus on apertures, on how light is controlled and sculpted with the structure, on how the various programmatic requirements of a library demands different light and spatial conditions. It should also respond to the urban environment with an adjacent public square as part of the proposal. We will draw heavily on precedents to learn from, making large scale physical sectional models to study and test ideas. Students will be expected to work in various scales and resolutions, from 1:200 to 1:50 minimum. It aims to be an active studio where students will learn to actively, systematically and critically analyse other students’ work with the objective of healthy peer critique, fostering a strong studio culture. 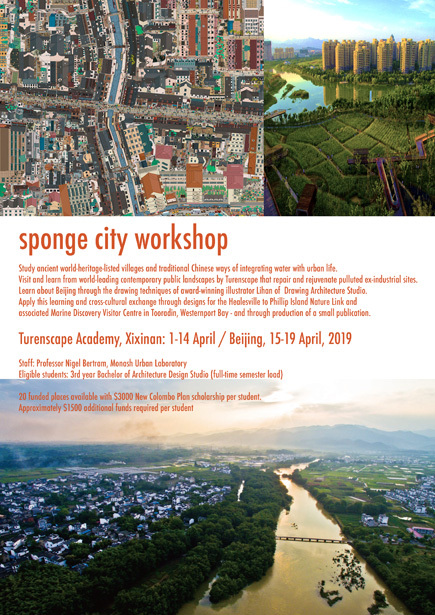 Study ancient world-heritage-listed villages and traditional Chinese ways of integrating water with urban life. Visit and learn from world-leading contemporary public landscapes by Turenscape that repair and rejuvenate pulluted ex-industrial sites. Learn about Beijing through the drawing techniques of award-winning illustrator Lihan of Drawing Architecture Studio. associated Marine Discovery Visitor Centre in Tooradin, Westernport Bay - and through production of a small publication. 20 funded places available with $3000 New Colombo Plan scholarship per student. Be it the Mexico/US border North and South Korea or The Pacific solution walls/borders front national anxieties. These are imagined as sites of provocation and their materiality our canvas, the studio will closely research and map these contested sites and propose alternative provocations. 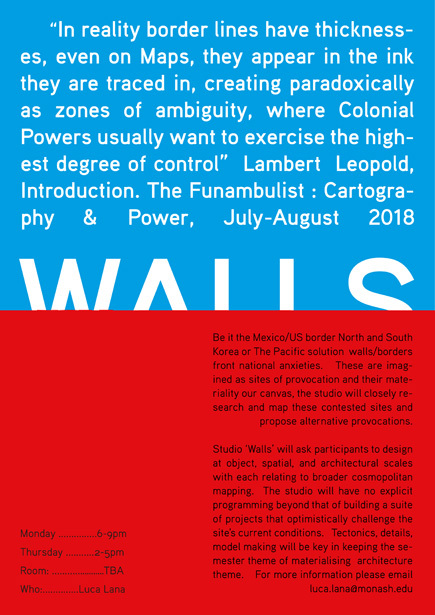 Studio ‘Walls’ will ask participants to design at object, spatial, and architectural scales with each relating to broader cosmopolitan mapping. The studio will have no explicit programming beyond that of building a suite of projects that optimistically challenge the site's current conditions. Tectonics, details, model making will be key in keeping the semester theme of materialising architecture theme. a cluster of things that have come or been brought together. Aggregations are ubiquitous. 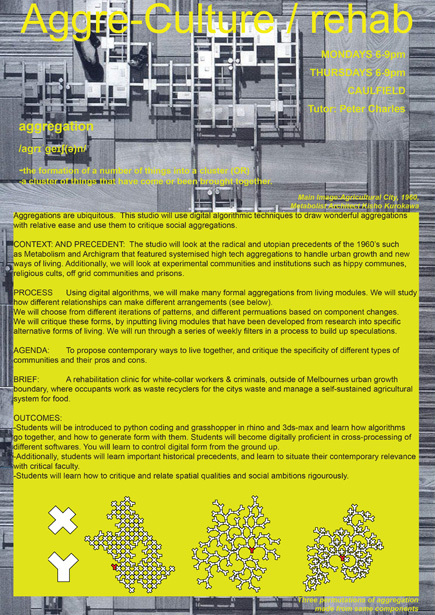 This studio will use digital algorithmic techniques to draw wonderful aggregations with relative ease and use them to critique social aggregations. The studio will look at the radical and utopian precedents of the 1960’s such as Metabolism and Archigram that featured systemised high tech aggregations to handle urban growth and new ways of living. Additionally, we will look at experimental communities and institutions such as hippy communes, religious cults, off grid communities and prisons. Using digital algorithms, we will make many formal aggregations from living modules. We will study how different relationships can make different arrangements. We will choose from different iterations of patterns, and different permuations based on component changes. We will critique these forms, by inputting living modules that have been developed from research into specific alternative forms of living. We will run through a series of weekly filters in a process to build up speculations. To propose contemporary ways to live together, and critique the specificity of different types of communities and their pros and cons. A rehabilitation clinic for white-collar workers & criminals, outside of Melbournes urban growth boundary, where occupants work as waste recyclers for the citys waste and manage a self-sustained agricultural system for food. Students will be introduced to python coding and grasshopper in rhino and 3ds-max and learn how algorithms go together, and how to generate form with them. Students will become digitally proficient in cross-processing of different softwares. You will learn to control digital form from the ground up. Additionally, students will learn important historical precedents, and learn to situate their contemporary relevance with critical faculty. Students will learn how to critique and relate spatial qualities and social ambitions rigourously. In late January the remaining members of theexperimental 1960’s collective Archigram sold their collective work to a visual culture museum in Hong Kong for €2.08 Million. The British Arts Council tried, unsuccessfully, to halt the sale for reasons to retain a domestic cultural heritage on the British Isles. (!!) However no British buyer was found in the last 8 moths before the sale to the Asian museum. Archigram member Dennis Crompton said that parts of the collection of over 10.000 drawings, models, writings, etc had been ‘in boxes and under beds’ for the past 40 years. The M+ museum in Hong Kong is design by Swiss architecture rm Herzon + de Meuron. Also in late January, on behalf of Herzog + de Meuron’s practice the Jacques Herzog und Pierre de Meuron Kabinett, a private foundation of the architects, who’s aim is ‘to have the holdings permanently domiciled in Basel in their entirety’ donated a portion of their archive to MoMA in New York. The new inclusion to the museum’s permanent collection contains of 23 works including drawings, models, etc. The studio seeks design proposals for an architectural archive in Melbourne. The archive will catalogue, store, restore, study and exhibit a collective architectural discourse for Australia. What is considered part of a discourse? What is preserved, documented or exhibited? How does one catalogue, study such a discourse? The site is on the eastern corner Collins Street and Manchester Lane inside Melbourne’s Hoddle grid. The studio will search for ways of analysing a site by drawing, diagramming, model making, reading and re-drawing. There has been a strong relationship between cinema and architecture since the beginning of the previous century. More recently both forms of expression have commercialised to a standardised digestable outcome. The studio will use a cinematic approach to conceive and investigate your architecture. Your design projects will use filmic techniques such as montage, frame, cut, pan, edit, fade-out, etc. A series of different creative tasks / experiments exploring the atmosphere of spaces Focus on colour, composition and proportion to help you generate a coherent architectural proposal rich in spatial and sensory qualities explore & cultivate your own form of creative expression. 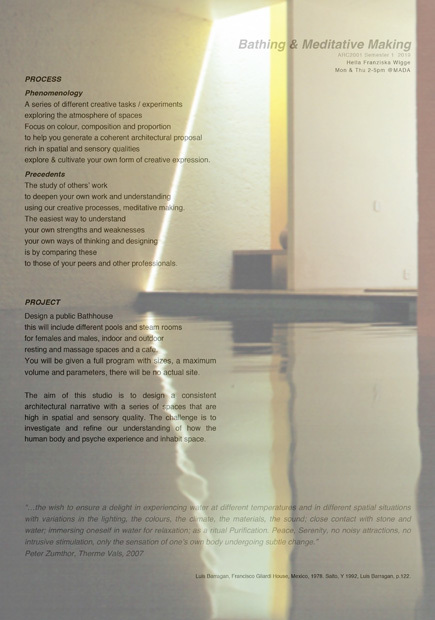 The study of others’ work to deepen your own work and understanding using our creative processes, meditative making. The easiest way to understand your own strengths and weaknesses your own ways of thinking and designing is by comparing these to those of your peers and other professionals. Design a public Bathhouse this will include different pools and steam rooms for females and males, indoor and outdoor resting and massage spaces and a cafe. You will be given a full program with sizes, a maximum volume and parameters, there will be no actual site. The aim of this studio is to design a consistent architectural narrative with a series of spaces that are high in spatial and sensory quality. The challenge is to investigate and refine our understanding of how the human body and psyche experience and inhabit space. Codes of Journey is focused on morphological generation exploration, development, and presentation of architectural solutions through the use of advanced 3D modeling in Rhino. In the studio, students will begin by employing 4D diagramming techniques as tools to study and analyse site movements and circulations. From these investigations students will explore the morphological translation of the spatial and temporal diagrams into architectural form. The studio will explore the possibilities of experiencing space by defining a journey that is influenced by human behaviour and movement. What is the journey? How is the journey perceived? How is the sensation of entering a new dimension translated? What is the experience of travelling in “Wanderland”? What are the elements that define this experience? What are the codes of journey? Is the built form/ environment a tool providing the opportunity to achieve this experience? Or is the built form the experience itself? Movement and circulation will be the main focus of the studio. By studying how people move through space. 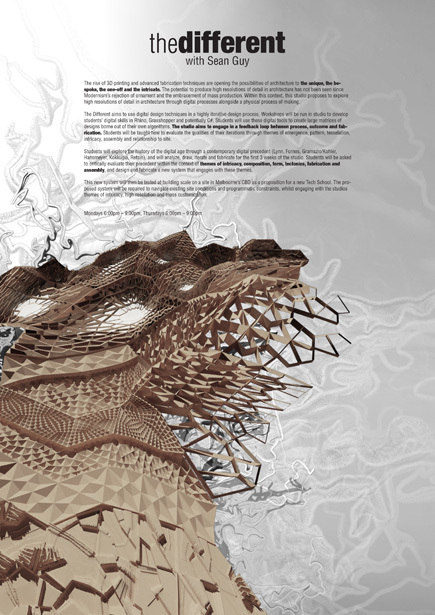 the studio will explore how human circulation networks can shape the built form. Can we re-define/ re-identify the human behaviour/ movement through the built form/ space? The perception of space will be explored by studying movements through it and its program. Each project will be presented with a set of drawings, diagrams, and perspectives/renders and/or models to communicate design ideas. Scale and number of drawings will be specified throughout the semester based on each project. Site analysis is the preliminary phase of the architectural design process. Students will be expected to create mapping diagrams that will set the foundation/ codes of each project. Urban parameters will be used as the essential design input. After having a clear understanding of the context and the urban links. the students will focus on defining the market program. A 4D diagramming method will be used: 3D spatial + 1D temporal which will allow changes in use over time dictating aspects of morphology. Each proposal should be programmed and designed for different times of the day. The studio will provide ease studies intended to familiarise the students with fundamentals of form making – including 3d modelling (Rhino) workshops. The case studies/ workshops will provide the opportunity to facilitate the morphological development of the projects. 3D modelling is the primary vehicle for exploring, developing and presenting design ideas. Models will allow the exploration of a higher degree of complexity and experience of the three-dimensional nature of architectural forms and spaces. While models are primary in this studio, drawing exercises supplement each project. The site is the inner suburb St Kilda of the metropolitan area of Melbourne. Being located just 6km from the city centre provides students with the opportunity of frequent site visits. Scripting/ coding is not part of the studio. Grasshopper/ Phyton knowledge is not required. Students will be asked to use Rhino or similar 3D modelling programs for form making, design investigation and visualisation. The rise of 3D printing and advanced fabrication techniques are opening the possibilities of architecture to the unique, the bespoke, the one-off and the intricate. The potential to produce high resolutions of detail in architecture has not been seen since Modernism’s rejection of ornament and the embracement of mass production. Within this context, this studio proposes to explore high resolutions of detail in architecture through digital processes alongside a physical process of making. The Different aims to use digital design techniques in a highly iterative design process. Workshops will be run in studio to develop students’ digital skills in Rhino, Grasshopper and potentially C#. Students will use these digital tools to create large matrices of designs borne out of their own algorithms. The studio aims to engage in a feedback loop between process, outcome and fabrication. Students will be taught how to evaluate the qualities of their iterations through themes of emergence, pattern, tesselation, intricacy, assembly and relationship to site. Students will explore the history of the digital age through a contemporary digital precedent (Lynn, Fornes, Gramazio/Kohler, Hansmeyer, Kokkugia, Retsin), and will analyze, draw, iterate and fabricate for the first 3 weeks of the studio. Students will be asked to critically evaluate their precedent within the context of themes of intricacy, composition, form, tectonics, fabrication and assembly, and design and fabricate a new system that engages with these themes. This new system will then be tested at building scale on a site in Melbourne’s CBD as a proposition for a new Tech School. The proposed system will be required to navigate existing site conditions and programmatic constraints, whilst engaging with the studios themes of intricacy, high resolution and mass customization. What if we were to ponder an architecture that defies convention and subverts habitual production. How can humour, fantasy, parody and satire begin to sow the seed of an architecture of absurdity, an infrastructure of the carnivalesque and an urbanism of the grotesque? The book transgresses conventional boundaries of style and subject, responding to aspects of allegory, fantasy, social critique, wordplay, parody, satire etc. His criticisms of the Roman Catholic Church are so telling that it is difficult to believe that Rabelais was a priest for most of his life. 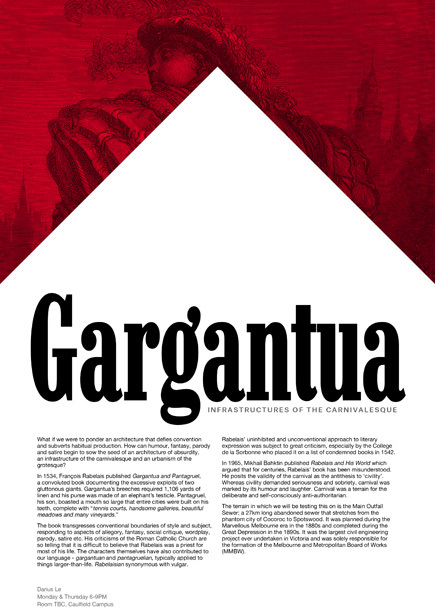 The characters themselves have also contributed to our language - gargantuan and pantagruelian, typically applied to things larger-than-life. Rabelaisian synonymous with vulgar. Rabelais’ uninhibited and unconventional approach to literary expression was subject to great criticism, especially by the College de la Sorbonne who placed it on a list of condemned books in 1542. In 1965, Mikhail Bahktin published Rabelais and His World which argued that for centuries, Rabelais’ book has been misunderstood. He posits the validity of the carnival as the antithesis to ‘civility’. Whereas civility demanded seriousness and sobriety, carnival was marked by its humour and laughter. Carnival was a terrain for the deliberate and self-consciously anti-authoritarian. The terrain in which we will be testing this on is the Main Outfall Sewer; a 27km long abandoned sewer that stretches from the phantom city of Cocoroc to Spotswood. It was planned during the Marvellous Melbourne era in the 1880s and completed during the Great Depression in the 1890s. It was the largest civil engineering project ever undertaken in Victoria and was solely responsible for the formation of the Melbourne and Metropolitan Board of Works (MMBW). A process where space is excavated from solids rather than a continuum made tectonically by addition and jointing is considered by Gottfied Semper to be ‘Stereotomy’. This notion offers an opening into the practice of casting and its inherent potentials to generate and materialise architectural concepts, developments, and outcomes, key areas of investigation in this studio. 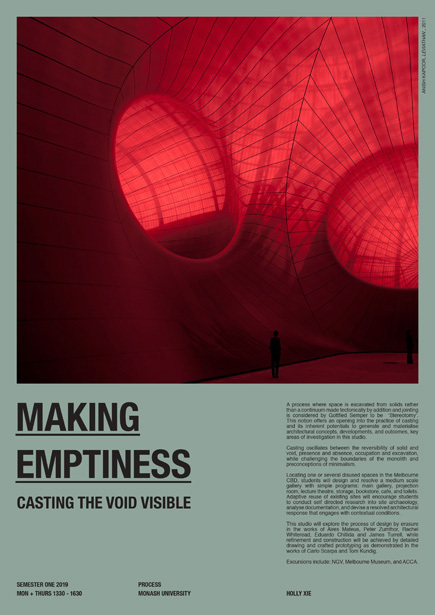 Casting oscillates between the reversibility of solid and void, presence and absence, occupation and excavation, while challenging the boundaries of the monolith and preconceptions of minimalism. Locating one or several disused spaces in the Melbourne CBD, students will design and resolve a medium scale gallery with simple programs: main gallery, projection room, lecture theatre, storage, bookstore, cafe, and toilets. Adaptive reuse of existing sites will encourage students to conduct self directed research into site archaeology, analyse documentation, and devise a resolved architectural response that engages with contextual conditions. This studio will explore the process of design by erasure in the works of Aires Mateus, Peter Zumthor, Rachel Whiteread, Eduardo Chillida and James Turrell, whilere nement and construction will be achieved by detailed drawing and crafted prototyping as demonstrated in the works of Carlo Scarpa and Tom Kundig. Excursions include: NGV, Melbourne Museum, and ACCA. The impending catastrophe that humanity confronts in the face of global warming can be attributed to one single originary cause: late-capitalism and its doctrine of ‘continuous growth.’ In this context, however—in which scientific evidence is widely available—humanity is surprisingly still dormant. Evidence of this affirmation is the lack of compromise shown by our political representation, as well as by our limited capacity to participate in sustained forms of collective action. Arguably, this is the result of what theorist Mark Fisher called “capitalist realism,” but also of poor forms of global warming representation, which have largely failed to shock the public and mobilise people into action. This studio offers the opportunity to learn how architecture can contribute to addressing this predicament, while exploring ways in which design can be exercised as a form of political commentary. While inviting students to understand architectural design as a process with open-ended results, the studio seeks to harness the discipline’s capacity to question and challenge the status quo. In times where the consequences of global warming seem irreversible, Map of Doom suggests that architecture can at least con- tribute to finding more effective ways to represent and communicate them. Beyond harnessing evident ‘design opportunities’ (e.g. Bjarke Ingels Group’s ‘The BIG-U’ project, etc.) are there any additional roles that architecture can play in the context of global warming? Is architecture a political activity? Can architecture express discontent, and thus stimulate forms of collective action? Are there any productive correlations between architecture and other creative disciplines such as lm, literature, fine art, and music? 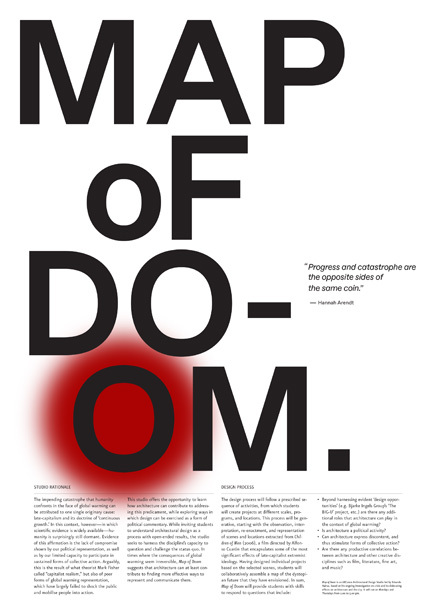 Map of Doom is an ARC2001 Architectural Design Studio led by Eduardo Kairuz, based on his ongoing investigation on crisis and its dislocating effects on architecture and the city. It will run on Mondays and Thursdays from 2.00 to 5.00 pm. Through an accumulative series of generative processes and severe consideration, editing and curation, students will work towards developing a sports and leisure centre at the nexus of transport, public and private programs at Mayor’s Park in Clifton Hill. This will go somewhat in the way of the avant garde creations of Mr Squiggle (for anyone that may remember) or the Surrealist exercise of the ‘Exquisite Corpse’. 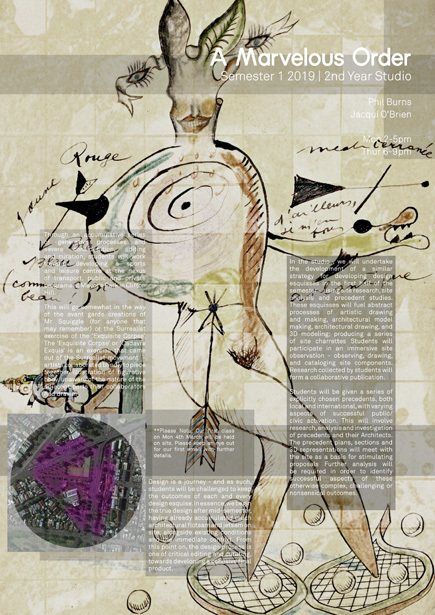 The ‘Exquisite Corpse’ or ‘Cadavre Exquis’ is an exercise that came out of the Surrealist movement - artists collaborated blindly to piece together illustration of figurative body, unaware of the nature of the adjacent parts their collaborators had drawn. In the studio , we will undertake the development of a similar strategy for developing design esquisses in the first half of the semester - using site research, site analysis and precedent studies. These esquisses will fuel abstract processes of artistic drawing and making, architectural model making, architectural drawing, and 3D modeling; producing a series of site charrettes Students will participate in an immersive site observation - observing, drawing, and cataloging site components. Research collected by students will form a collaborative publication. Students will be given a series of explicitly chosen precedents, both local and international, with varying aspects of successful public/ civic activation. This will involve research, analysis and investigation of precedents and their Architects. The precedent plans, sections and 3D representations will meet with the site as a basis for stimulating proposals Further analysis will be required in order to identify successful aspects of these otherwise complex, challenging or nonsensical outcomes. Design is a journey - and as such, students will be challenged to keep the outcomes of each and every design esquise. In essence, we begin the true design after mid-semester, having already accumulated much architectural flotsam and jetsam on site, alongside existing conditions and the immediate context. From this point on, the design process is one of critical editing and curating, towards developing a cohesive final product. **Please Note: Our first class on Mon 4th March will be held on site. Please keep an eye out for our first email with further details. ‘On Virtuality’ is a research and design unit that introduces students to new approaches to design process by way of digital imaging technologies. Students will develop advanced skills in digital design processes, 3D scanning, 3D printing and virtual reality whilst engaging in current disciplinary inquiry into cultural heritage and architectural preservation. The initial phase of the studio will be focused on developing knowledge and skills in image capture technology, specifically 3D scanning and photography. Students will work to produce a digital archive of 3D scanned artifacts from the site of investigation - The Shrine of Remembrance, Melbourne. 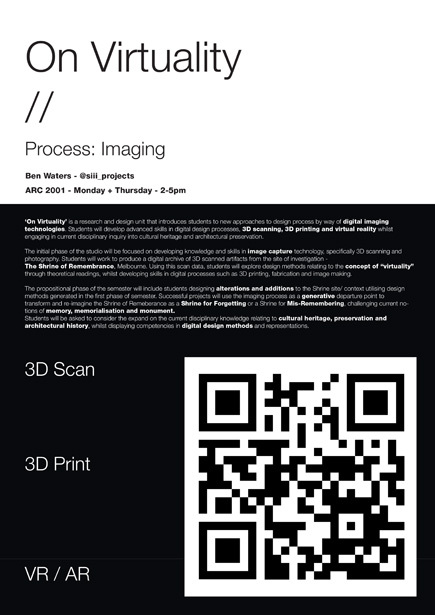 Using this scan data, students will explore design methods relating to the concept of “virtuality” through theoretical readings, whilst developing skills in digital processes such as 3D printing, fabrication and image making. The propositional phase of the semester will include students designing alterations and additions to the Shrine site/ context utilising design methods generated in the first phase of semester. 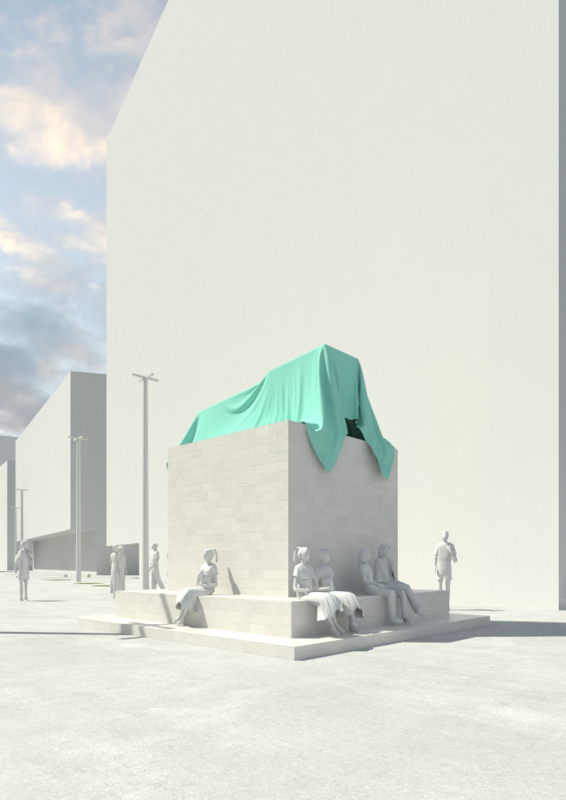 Successful projects will use the imaging process as a generative departure point to transform and re-imagine the Shrine of Remeberance as a Shrine for Forgetting or a Shrine for Mis-Remembering, challenging current notions of memory, memorialisation and monument. Students will be asked to consider the expand on the current disciplinary knowledge relating to cultural heritage, preservation and architectural history, whilst displaying competencies in digital design methods and representations. By using maps as active creative tools rather than static repositories of data, Taking the bend seeks to challenge top down approaches of master planning in favour of a micro-to-macro set of hybrid maps that can mark observations, conditions and, historical traces, alternating between subjective and objective approaches; as a process for understanding site, further developing these findings through more drawing and modelmaking into proposing frameworks for possibilities of inhabitation and experience. Students will be introduced to mapmaking as a tool for observing and understanding site, for collecting and charting glimpses of conditions and histories, and as a means to analyse and critique proposals and policies, promoted on the basis of all-encompassing masterplans and sketchy renders. Subsequently, we will explore urban mapping as a tool for design, testing maps’ potential to display details that are unseen, revealing tangible and intangible relationships and conditions without relying on text and numerical data. 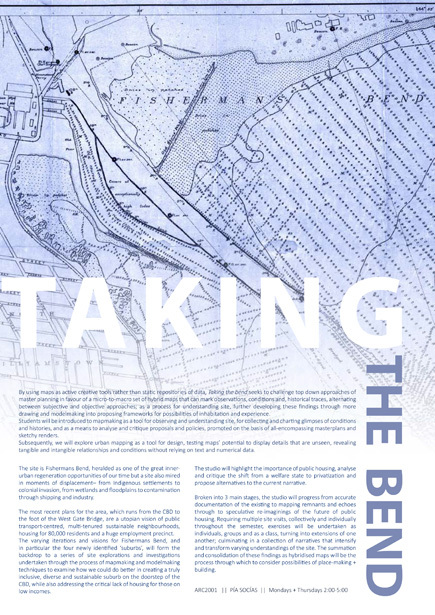 The site is Fishermans Bend, heralded as one of the great inner-urban regeneration opportunities of our me but a site also mired in moments of displacement– from Indigenous settlements to colonial invasion, from wetlands and floodplains to contamination through shipping and industry. The most recent plans for the area, which runs from the CBD to the foot of the West Gate Bridge, are a utopian vision of public transport-centred, multi-tenured sustainable neighbourhoods, housing for 80,000 residents and a huge employment precinct. The varying iterations and visions for Fishermans Bend, and in particular the four newly identified ‘suburbs’, will form the backdrop to a series of site explorations and investigations undertaken through the process of mapmaking and modelmaking techniques to examine how we could do better in creating a truly inclusive, diverse and sustainable suburb on the doorstep of the CBD, while also addressing the critical lack of housing for those on low incomes. The studio will highlight the importance of public housing, analyse and critique the shift from a welfare state to privatization and propose alternatives to the current narrative. Broken into 3 main stages, the studio will progress from accurate documentation of the existing to mapping remnants and echoes through to speculative re-imaginings of the future of public housing. Requiring multiple site visits, collectively and individually throughout the semester, exercises will be undertaken as individuals, groups and as a class, turning into extensions of one another; culminating in a collection of narratives that intensify and transform varying understandings of the site. The summa on and consolidation of these findings as hybridised maps will be the process through which to consider possibilities of place-making + building.